Can a feudal era General and famed military strategist act as a modern day Cupid? After my return from Tarui, where I and Yohsuke together paid respects at General Hanbei’s grave, things started looking up for me. 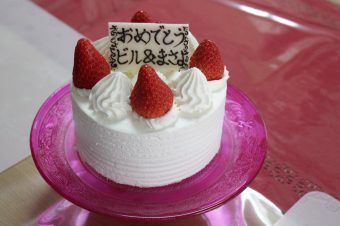 A series of mysterious, hard to explain events occurred and the next time I saw Masayo, at a party to which a mutual friend invited her, I found myself at the end of the evening becoming Masayo’s close friend and trusted confidant. (Oh, she loved the Komi-brand sauce) We continued to see each other over the summer, became even closer, and it was a truly happy time for me. However, in the end we were still “just friends.” Having been down that road many times before, I knew I had to do something pretty soon or else Masayo was going to start discussing her boyfriend troubles with me. I really didn’t want to hear about some boyfriend causing Masayo problems, I wanted to be the boyfriend causing her problems. 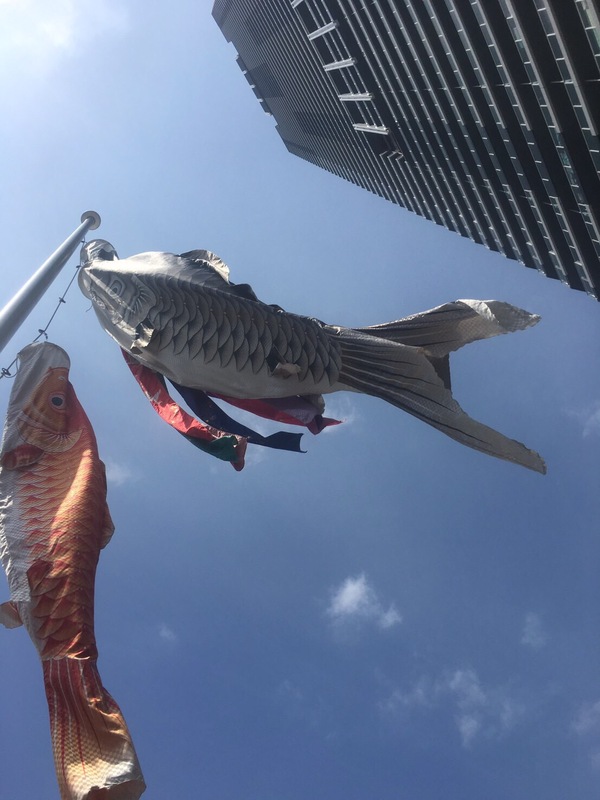 In early July I received an email from Yohsuke, now living in Hyogo Prefecture. Remember the drunken conversation about me participating, in Benkei get up, in Tarui’s September parade? 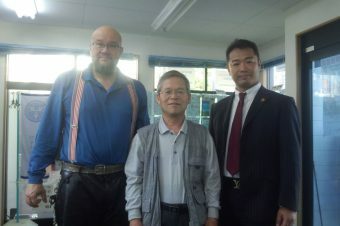 Well, it turns out Mr. Fuwa talked to the Tarui Chamber of Commerce folks, and I was officially invited to join. I told Yohsuke I would borrow a set of armor for him to wear, and he should march in Tarui’s parade representing the return of the Takenaka liege. Yohsuke thought that was a great idea. I also asked Masayo if she would like to join Yohsuke and me for the Tarui parade. She did. The Battle of Sekighara determined the fate of Lord Ieyasu Tokugawa. It was a gamble for him to rule “All Under Heaven.” As it turned out, the opening of the battle found Lord Ieyasu in a very disadvantageous position. The forces of General Mitsunari occupied all of the high ground surrounding Sekigahara. 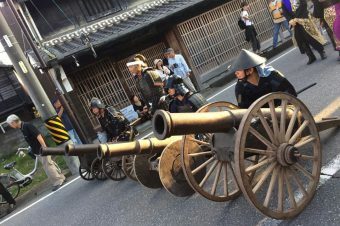 Lord Ieyasu’s main battle force, loyal only to him and under the command of his son Hidetada, was hung up battling the forces of Sanada at Ueda Castle in today’s Nagano Prefecture. 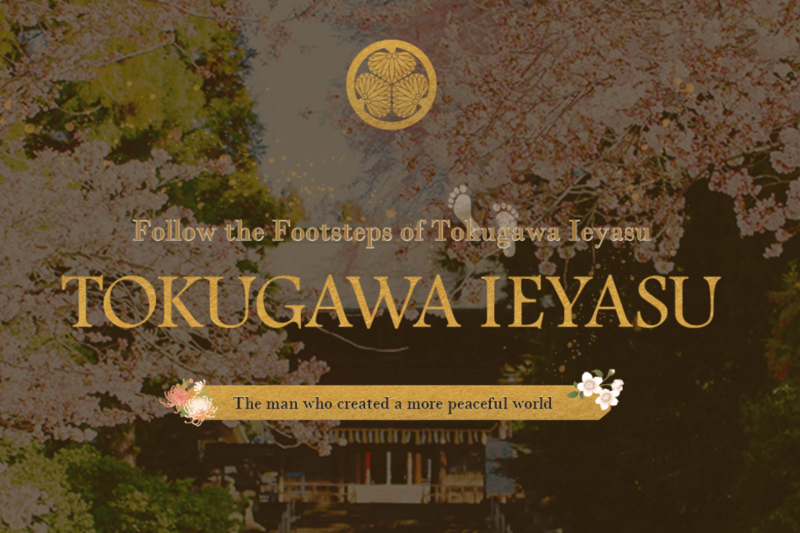 The forces Lord Ieyasu had with him to start the battle were mostly former generals and armies serving Lord Hideyoshi Toyotomi, and were of questionable allegiance. Any modern military tactician, looking at the disposition of the opposing forces and knowing Lord Ieyasu’s primary battle force was not available for combat that day, would conclude victory was General Mitsunari’s for the taking. However, in my opinion, even during this battle fought long after General Hanbei’s death, General Hanbei delivered via proxy a deciding victory to Lord Ieyasu. A battle which everyone thought would last for months was decided in a little over six hours. This is truly remarkable. While the Battle of Sekigahara I will cover in later issues of this column, in order to understand how my personal tale unfolds, one must understand the pivotal role General Hanbei played in the Battle of Sekigahara, fought 20 years after his death. For that we must again travel back in time, to 1578. While I have earlier mentioned General Hanbei was famous as a military strategist to Lord Hideyoshi Toyotomi, there was also another famous military strategist serving Lord Hideyoshi, being so assigned by Lord Nobunaga Oda. That was General Kanbei Kuroda. (Hereafter referred to as General Kuroda to avoid confusion with General Hanbei.) As was common during those times, when General Kuroda first began service with Lord Nobunaga, General Kuroda offered up his son Shojumaru to be a hostage. During this era, hostages were just as important as politically arranged marriages to ensure loyalty. In 1578 however, some of Lord Nobunaga’s generals began to mutiny. The central figure was General Murashige Araki. 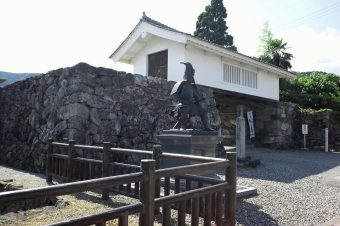 General Kuroda took it upon himself to travel to General Araki’s castle in Settsu (present day Settsu city in Osaka Prefecture) to convince General Araki to return to the Nobunaga fold. General Araki ended up throwing General Kuroda in an underground dungeon and let him languish for over a year. Lord Nobunaga, after receiving no word from General Kuroda, was convinced General Kuroda had also defected, and ordered General Hanbei to execute the hostage Shojumaru. General Hanbei took it upon himself to hide Shojumaru instead, and entrusted Shojumaru’s care to one of his most trusted retainers, Yatari Fuwa. Reunited with his father after General Kuroda was rescued from the dungeon (which was after General Hanbei’s death), Shojumaru safely reached adulthood and took the name of Nagamasa. General Nagamasa later entered the service of Lord Ieyasu Tokugawa, and fought for Lord Ieyasu at the battle of Sekigahara. 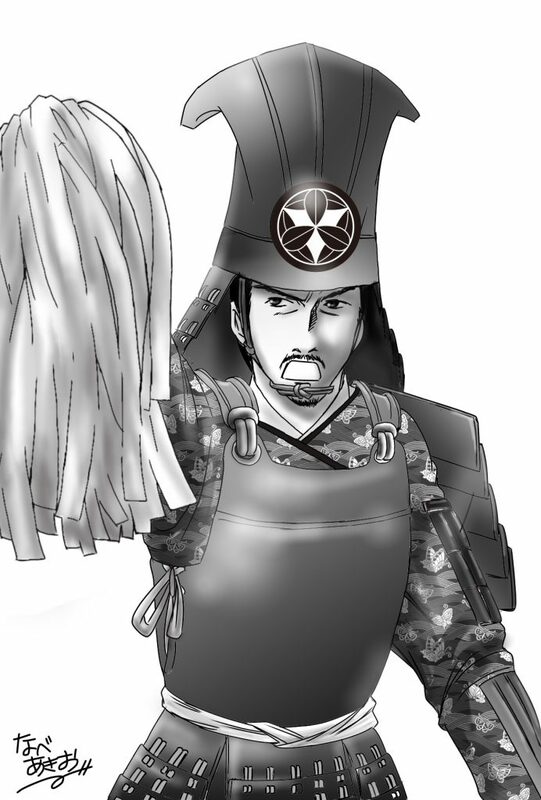 This was the general who participated in the Battle of Sekigahara wearing General Hanbei’s coveted Ichi-no-Tani helmet. General Nagamasa was, in my opinion, absolutely crucial to bringing about victory for Lord Ieyasu. While his exploits before and during the battle will be the subject of a later column, suffice it to say General Nagamasa was the most highly rewarded amongst Lord Ieyasu’s generals. Lord Ieyasu of course recognized the massive contribution made by General Nagamasa. So, what does all of this have to do with Masayo and me? Well, just as the Battle of Sekigahara, fought on September 15th, decided whether or not Lord Ieyasu won or lost “All Under Heaven,” I decided this would be a good time for me to take the plunge and once again try to win “All Under Heaven.” My personal big gamble would come on September 14th, driving back from Tarui. For that, though, I needed some help. What better person to ask than General Hanbei? After all, Yohsuke, Masayo and I would all pay our respects at his grave on the morning of the 14th. That would be great time to ask for his help. 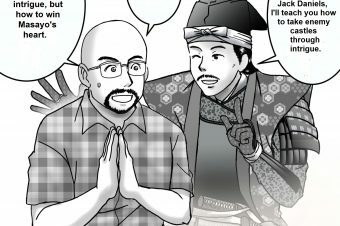 If nothing else, General Hanbei would get a good laugh out of this weird foreigner asking for his assistance in affairs of the heart. With that thought in mind, instead of the usual sake to offer at his grave, I went and procured a bottle of Jack Daniels. Here is a picture of me mobilizing for the Tarui parade, taken the day before we departed. 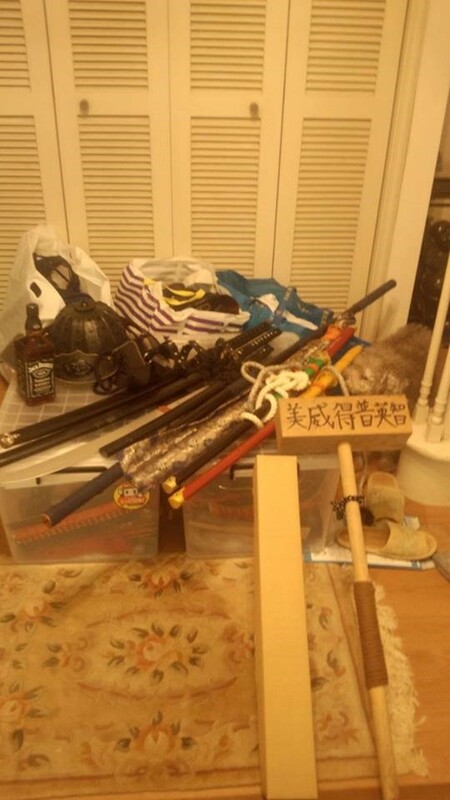 The furry bundle on the right is my dog Poncho, practically buried amongst the weapons. He thought he was going to go to Tarui as well, but unfortunately for him, he ended up going to a doggie hotel instead. Note the bottle of JD. 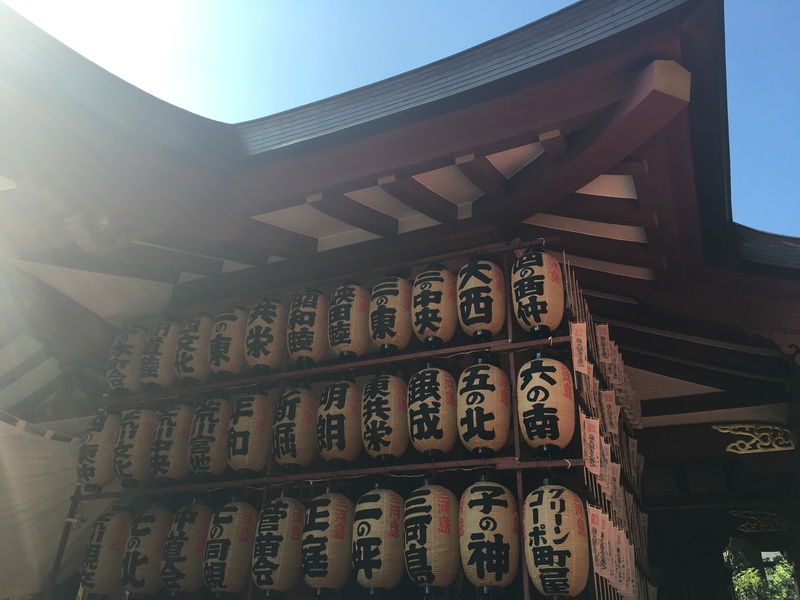 Location: Zendouji Temple, Tarui town, Gifu Prefecture. Family temple for the Takenaka family. General Hanbei Takenaka, famous Sengoku period military strategist. 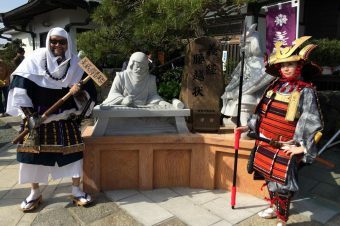 Benkei, famous Kamakura period warrior monk. Lord Yoshitsune Minamoto, famous Kamakura period warlord and brilliant military tactician, Benkei’s chosen liege.